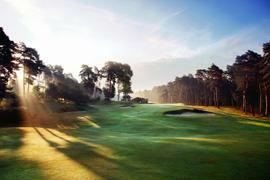 Regarded by many as Harry Colt’s crowning glory, St George’s Hill Golf Club has been one of England’s most revered Clubs since 1913 and will host the World Superyacht Awards Elite golf day on 16 May 2019. Situated in the heart of Surrey’s beautiful heathland and yet only an hour from Central London, the Club sits within an exclusive private estate. Each hole carries its own distinct character, blending together seamlessly for one of the most balanced and aesthetically pleasing tests of golfing prowess anywhere in the world. The Elite Golf Day is hosted by NetJets. Please read the Terms & Conditions below before proceeding with your applications.